Collect samples of the Maulborn curative. Quarantine Serk — Discover the truth behind the Maulborn curative. Alchemist Nilyne Hlor doesn't trust the proprietary formula the Maulborn use to make their curative. She wants to examine a few bottles so she can determine how the elixir is made. Collect five bottles of Maulborn curative for Nilyne Hlor. The Maulborn refuse to let Nilyne Hlor, the town alchemist, find out the ingredients of the Llodos plague curative. They say it is a "proprietary formula." She asks you to collect five bottles of the Maulborn Curative. You can find the plague samples within the Serk Catacombs. The samples are not instanced, meaning you have to share them with other players who are on the quest. If you pick up one sample of the curative, a nearby player cannot pick up the one you just grabbed, and would need to wait for it to respawn. Once you have all five samples, speak with Nilyne Outside the quarantine. She's rather close to Verobar House, which is where Aerona Berendas, a character from a concurrent quest, will most likely be. Nilyne will have your reward. Nilyne asked me to enter the quarantine and gather a few samples of the Maulborn curative for her. Finishes quest I collected a number of bottles of the Maulborn curative. 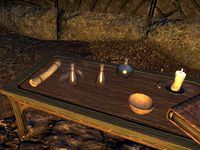 Now I should take them to Nilyne Hlor so she can determine what was used to create the elixir.